Collagen supplementation reduces pain in the knee joint of osteoarthritis sufferers over the age of forty. The Czech rheumatologists Tomas Trc and Jana Bohmova drew this conclusion after studying about one hundred sufferers. Joints are largely composed of cartilage, and cartilage is largely composed of collagen. If your joints are troubling you, consuming more collagen may help. The idea isn't new. Back in 1175 the mystic and abbess Hildegard van Bingen wrote in a medical book that drinking soup made from the gelatine in cattle hooves relieves painful joints. Half a dozen mainly German studies from the second half of the twentieth century have also shown the positive effects of gelatine and collagen on joints. In the study upon which this article is based the researchers used the collagen preparation Colatech, a product of the Spanish FDG Farmadiet Group. 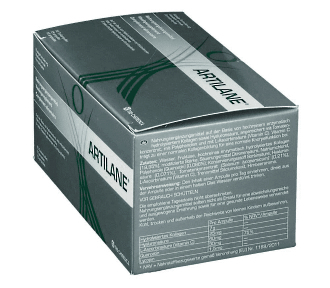 [fdg-farmadiet.com] It's found – together with lycopene, quercetin, vitamin C and hyaluronic acid – in functional foods for joints such as Artilane. The researchers divided their subjects into two groups. One group was given 10 g collagen every day for 13 weeks; the other took 1.5 g glucosamine sulphate [GS] every day. The comparison is not entirely fair. Glucosamine sulphate probably works in a different way to collagen. A popular theory is that joints use glucosamine as a building block for complex molecules that function as a kind of lubricant, while collagen supplementation is believed to help cartilage to grow. But never mind. On four occasions the subjects were asked to rank the pain in their joints, on a scale from 0 to 10. The higher the score, the worse the pain. Both supplements reduced the pain in the knee joint, but the 10 g collagen was more effective than the 1.5 g glucosamine sulphate. After 13 weeks of collagen supplementation the subjects indicated that the level of pain that they felt was 2 points less than at the start of the experiment. The researchers asked about four kinds of pain: typical pain, pain-right-now, pain-at-its-worst and pain-at-its-best. The table above shows the averages of the four scores. As you can see, 37 percent of the subjects in the glucosamine reported an improvement in pain of two points or more [>20 mm]. In the collagen group the figure was 68 percent. Ten percent of the collagen users reported mild side effects, such as a rumbling stomach and flatulence. The glucosamine group reported similar side effects, but these were less frequent. A couple of weeks ago we described a study in which collagen supplementation gave athletes relief from painful joints.